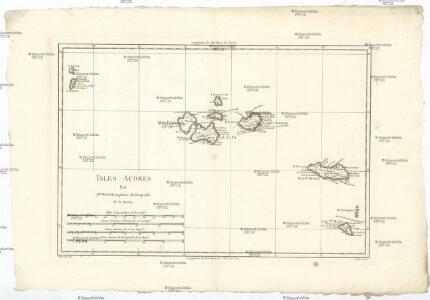 Chart of the Acores (Hawks) Islands. Portuguese Islands in the Atlantic Ocean. 1 : 2300000 Lucas, Fielding Jr.
1 : 650000 Thoulet, J. (Marie Julien Olivier), 1843-1936 Viellemard Fils et Cie.
A cidade de Angra na ilha de Iesu xpo da Tercera que esta em 39. graos. Iles Acores. Afrique 1 bis. Kanárské ostrovy Borda, Jean-Charles de Norie & Co.
Map of the western parts of the colony of Virginia / J. Gibson sculpt. De cust van Barbaria, Gualata, Arguyn, en Geneheo, van Capo Verde. United States of America, 1834 / by H.S. Tanner; engraved by H.S. Tanner, assisted by E.B. Dawson, W. Allen & J. Knight. Nova tabula geographica complectens borealiorem Americae partem. [Map of the North Atlantic Ocean to accompany Jonathan Williams' article on the use of the thermometer in discovering banks, soundings, etc..]; Transactions of the American Philosophical Society.